The Institute of Chartered Accountants in England and Wales (ICAEW) has joined forces with Crelos to produce a guide to assessing the current capabilities and future potential of management teams aimed at giving investors the advice and tools they need to assess the management potential of a company prior to investing. The performance of the management team is a key factor in creating a high performance business. Studies have shown that as much as 40% of the return on investment in an organisation can be attributed to the strength of the CEO and their management team. Therefore assessment and subsequent ongoing development of the management team is a key driver of business success. But how does the recognition of this key value driver translate into the due diligence process adopted pre-investment? There is a widely held myth that it is difficult to "prove and measure" the capability of a management team. However, the precision of the psychological measurement of people, organisations and performance has evolved immensely over the past 10 years. This should be good news for Corporate Financiers and Investors, who can now use such techniques to significantly enhance the predictability of business performance. At Crelos, we are business psychologists, and we know that human capital due diligence is every bit as important as financial due diligence. So we have just launched a dedicated offer to assist investors assess the capability of management teams.  Thereby helping to significantly enhance the management control of the business, to underpin the investors' decision making and to deliver significant return on investment. 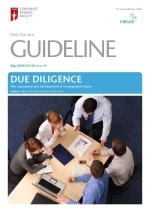 To find out more about why human capital due diligence is key to investment success, request a copy of our NEW guidelines . Just fill in the form and we will send you a copy in the post, or if you prefer send us an email at info@crelos.com , or call our dedicated number 01491 845548 . Yes, send me a copy of 'Due diligence - The assessment and development of management teams'.